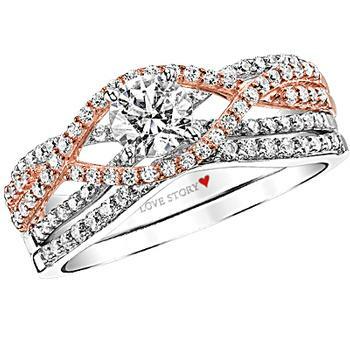 This stunning 14k white and rose gold engagement ring from our Love Story Only You Collection has .81cttw comprised of (1) .386ct round center diamond accented with (34) .006ct rounds, (36) .005ct rounds and (10) .004ctround diamonds. All diamond weights are approximate. Shown with a white gold wedding band which is sold separately.